In Italy they call it the sassofono, which sounds so much more sensual; but then that seems entirely appropriate, as soloist Mario Marzi hails from there. He has won a number of prestigious awards, has played with some of the best bands around and teaches sax at the Conservatorio Giuseppe Verdi in Milan, all of which augurs well for this new recording. I’ve been lucky enough to hear some fine sax discs in recent years, among them American Spectrum (BIS - see review) featuring Branford Marsalis, and a collection of contemporary saxophone quartets from the Tetraphonics (Cybele - see review). Both are highly desirable issues, not least because they demonstrate the sonic superiority of the SACD format. The works on this new hybrid SACD - recorded in 2004 but only released this year - may be more ‘mainstream’ but they’re no less daunting for that. The Glazunov concerto has fared quite well on disc - ArkivMusic lists nine versions - but the Villa-Lobos and Milhaud pieces are even more popular. For comparison’s sake I dug out a CD of saxophone concertos played by Eugène Rousseau (DG 453 9912) and, for the Villa-Lobos, I chose John Harle and the ASMF under Sir Neville Marriner (EMI Gemini 3 81529 2). In many ways Harle is the man to beat in this repertoire, especially when it comes to sheer beauty of tone and general boldness or chutzpah. That said, the Glazunov concerto, dedicated to the German saxophonist Sigurd Raschèr (1907-2001), is chockfull of lovely melodies. 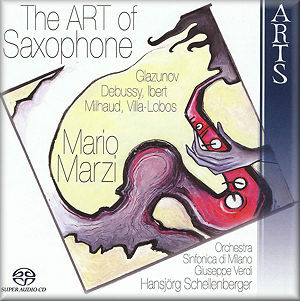 At the outset it’s clear that Marzi has a formidable technique; his tone is secure, his phrasing immaculate, and the DSD recording reproduces the sax’s distinctive timbres with astonishing fidelity. The orchestra sounds warm and detailed too, Schellenberger’s tempi well chosen, yet I found Marzi’s performance a little short on character. By comparison, Rousseau shades the music and varies the mood much more effectively. And even though the latter was recorded nearly 40 years ago the sax sound is still very appealing. I’m pleased to say Debussy’s Rhapsodie, which the composer transcribed from his earlier piece for saxophone and piano, is much more persuasive. Marzi plays with remarkable liquidity, bringing a late-afternoon languor to this lovely work. The Italian band, always alluring, bring a ray of Mediterranean sunshine to the proceedings as well. But it’s the soloist who takes the palm, with superb articulation and purity of tone. Whether it’s leaps or trills, high or low, Marzi sails through this music with ease. It’s very impressive, both as a performance and as a recording. Initially I was rather dubious about the need for so many microphones - all listed in the booklet - but the sheer range and beauty of sound they capture speaks for itself. Now the Ibert Concertino - also dedicated to Raschèr - really does need plenty of chutzpah. The Allegro con moto is full of wit and sparkle, both qualities that Marzi underlines in his performance. That said, I did find myself gravitating towards Rousseau’s more infectious rhythms and general joie de vivre. The Larghetto is another matter, though; here Marzi’s resonant, somewhat melancholic, sax sound is utterly captivating. I may have quibbled about the lack of nuance and shading in the Glazunov but there are no such reservations here. And even though Rousseau and Marzi are evenly matched in the Animato molto, the more tactile Arts recording might well be the deciding factor for some listeners. That goes for both the CD and SACD layers. The burbling rhythms of Milhaud’s Scaramouche - originally scored for two pianos - hold no terrors for Marzi, whose insouciant style suits the music rather well. But it’s in the mournful melodies of the second movement, marked Modéré, that Marzi really shines. Indeed, this is the kind of playing that induces goose bumps, such is the phenomenal breath control on display. Schellenberger is a discreet accompanist, the orchestra naturally balanced and, in the sultry Braziliera, alive to the work’s exotic rhythms. Some might prefer a more loose-limbed approach to this music but really Marzi’s Scaramouche is as good as it gets. The South American theme continues in the Villa-Lobos Fantasia, scored for either soprano or tenor sax; it may seem low key after the Milhaud, but what the opening movement lacks in sheer energy it makes up for in general sophistication. Harle is wonderfully assured here, Marzi even more so. Unfortunately the EMI recording is rather distant, which means you have to crank up the volume somewhat. The Arts disc needs no such tweaking, the full-bodied orchestra playing with point and animation throughout. The second movement, marked Lent, emphasises the sax’s upper registers, where the sound can so easily sound pinched. As expected Marzi carries it off with aplomb, as he does with the trills and associated pyrotechnics of the closing Très animé. The real treat in this collection is Milhaud’s La création du monde, surely one of the most atmospheric pieces written for sax and orchestra. I have very fond memories of Bernstein’s old EMI recording from Paris and shudder at Rattle’s soupy version on his ill-advised Jazz Album from the 1980s (also on EMI). Schellenberger and his band play a vital part in bringing this smoky, rhythmically diverse work to life, every instrumental detail easily heard. But it’s Marzi’s plangent playing - and that of the band’s lively percussionists - that deserves the most praise at this point. Despite my initial reservations - which seem nit-picky now - this has turned out to be a very special disc indeed. It’s made even more desirable by the addition of detailed, well-written liner notes - with cue points - that concentrate on the music rather than the performers. Other labels, please take note. Performance, sound and presentation all speak of high production values. A feast for all sax fans.